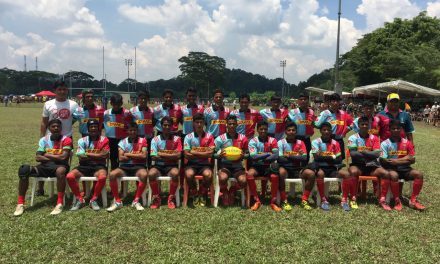 Round 3 of the World First Singapore Schools U14 Sevens Series returns this saturday with 12 schools eager to book their place in the finals, which will be played at the HSBC Singapore Rugby Sevens. Anglo Chinese School Independent (ACS(I)) has confirmed their spot in the finals after winning 2 consecutive tournaments while Saint Andrews Secondary School (SAS), Lycee Francaus de Singapour (LFS) and Anglo Chinese School (Barker Road) (ACS(Barker)) are all tied at second place. Round 2 kicked off with ACS(I) taking on Damai Secondary School in the morning. ACS(I) stamped their authority as defending champions by putting 9 tries pass Damai in the opening match. Runner-ups LFS, ACS (Barker) and SAS also won their opening games to keep pace with ACS (I). Almost an hour into the tournament, Fad’ly from Greenridge lifted up the stands by sprinting 80m to score between the posts against LFS! The gutsy LFS boys eventually came back to win the game 26-5. Intensity of the tournament peaked when Raffles Institution (RI) plays ACS (Barker). 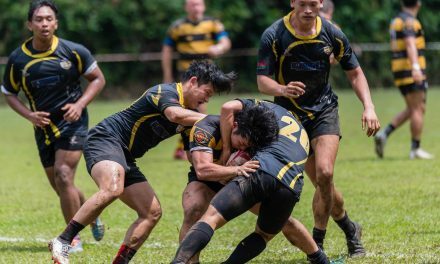 ACS (Barker) were the runner-ups of Round 1 while rugby powerhouse RI who missed Round 1, is striving to make up for lost time. Raffles started their first game in this tournament with 2 early tries! The game was also filled with big hits from both sides and RI came on top with a 29-7 win over the runner-ups. Semi final 1 sees ACS(I) take on LFS. LFS coached by Joan Luke had a wonderful campaign since the morning with wins against SJI and Greenridge. LFS held a very discipline defensive line and looks to be on top of ACS (I) from the get go. 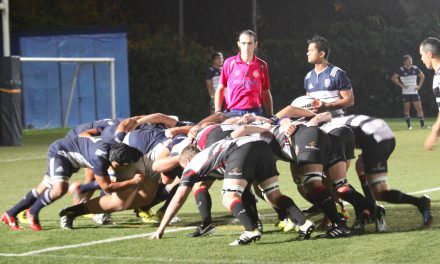 Several handling errors by ACS(I) gave LFS the opening try in this semi final encounter. ACS(I) showed why they are the tournament favorites by responding immediately after conceding. The team regrouped and a series of great support play saw ACS(I) broke LFS defense several times in the game to win 31-5. Traditional rivals SAS and RI took the field at Semi final 2. Both teams have a steady run up into the semi finals and both teams are backed with a loud parents support group! Saints drew first blood in this game but the resilient RI responded. The game eventually ended 14-14 and was brought into sudden death. RI took advantage of a mistake by a SAS player and ran through for a sudden death try! ACS (I) meets Raffles in the highly anticipated finals. Favorites ACS(I) started off the match with a series of great support play and recycling of the ball. On the other hand, RI’s disciplined defense were patiently waiting for a chance to counter attack whenever possible. It was an even game with both sides trading points but ACS(I) soon broke away with the lead as the game goes on. Final score 19-12 to ACS(I).